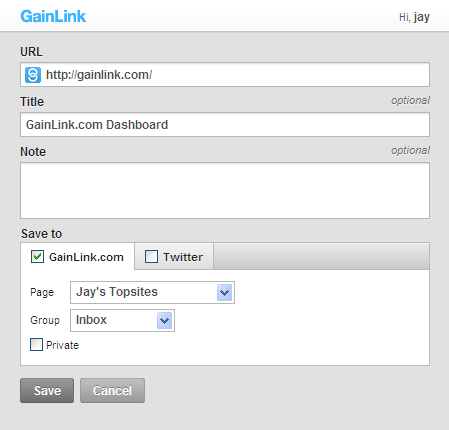 GainLink.com is an Advanced & Easy-to-Use Bookmark Management Service. 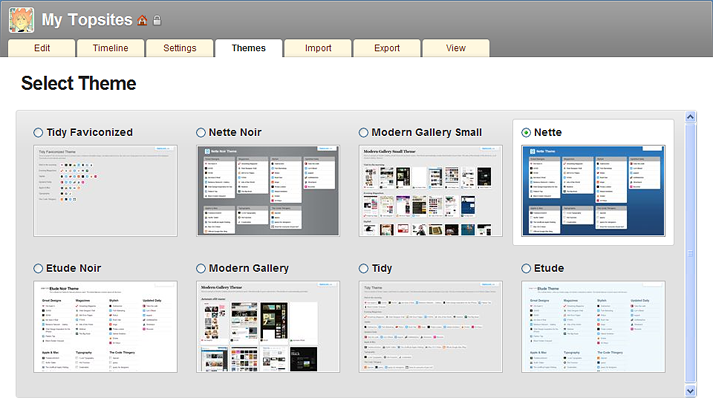 It's Private, Organizable, Responsive, and Skinnable. It's ideal for your Start Page. 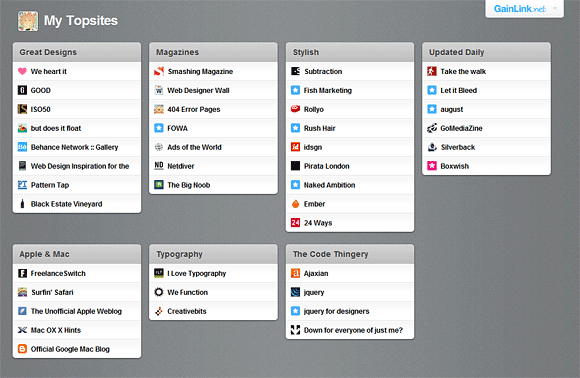 Fed up with your ever-growing, cluttered and clueless list of bookmarks? Miss the cleanliness after a fresh install of your browser? Refresh your start page with GainLink.com. Secure your bookmarks from the eyes and fingertips of family members, colleagues, and prying strangers. 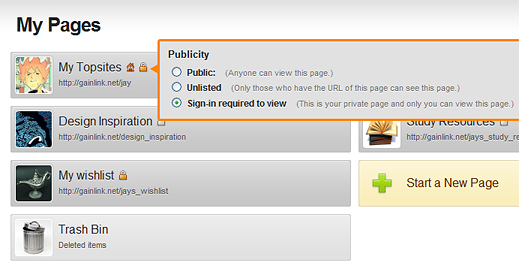 Privacy control is at the heart of the GainLink.com service design. We are constantly engineering the user interface to keep it stress-free and visually pleasing, an espresso of functionality. Enjoy the evolving user-interface as is shown in the demo clip above! You can pack everything in a single page or organize relevant links into multiple pages, because GainLink.com supports the creation of multiple pages per account. 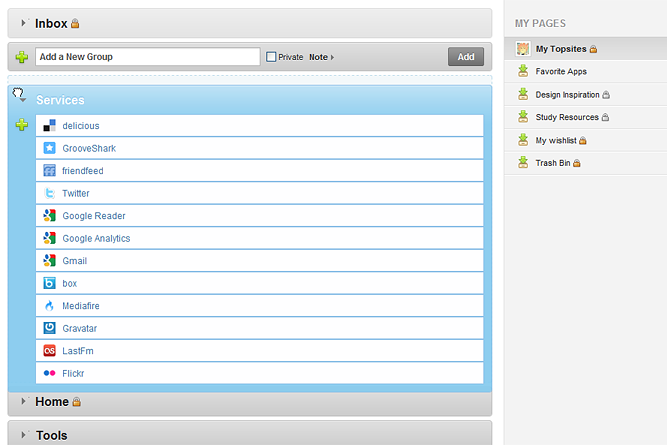 Give your page a customized makeover. We have themes to accommodate thumbnailer-lovers, minimalism-geeks, speed-maniacs, eyecandy-chasers, radioactive-otaku and extra-terrestrial aliens. Choose your theme. 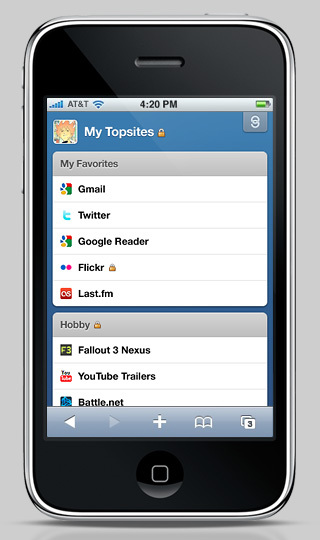 GainLink.com provides optimized themes for iPhone & iPod touch devices. These themes feature "Offline Cache" that enables openning your page at a breakneck speed with minimal 3G/EDGE connection. When our "Gain Link" bookmarklet is clicked, it will show a pop-up window, and you will be able to save the URL of the page you are looking at, onto one of your GainLink.com pages. Tweet the URLs you visit via our bookmarklet. Or bookmark and tweet a URL at the same time, if you will. Our bookmarklet is a simple, self-contained and OAuth-complaint Twitter posting client. Ever forget to log out from a public computer? 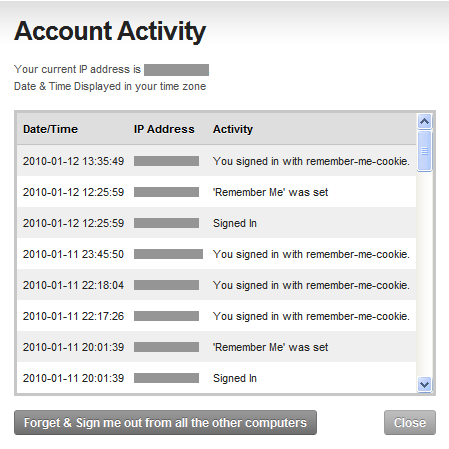 Our "Remote Log-Out" is a unique privacy feature that forcibly Logs-out all the other computers except the one you are using to Log in.